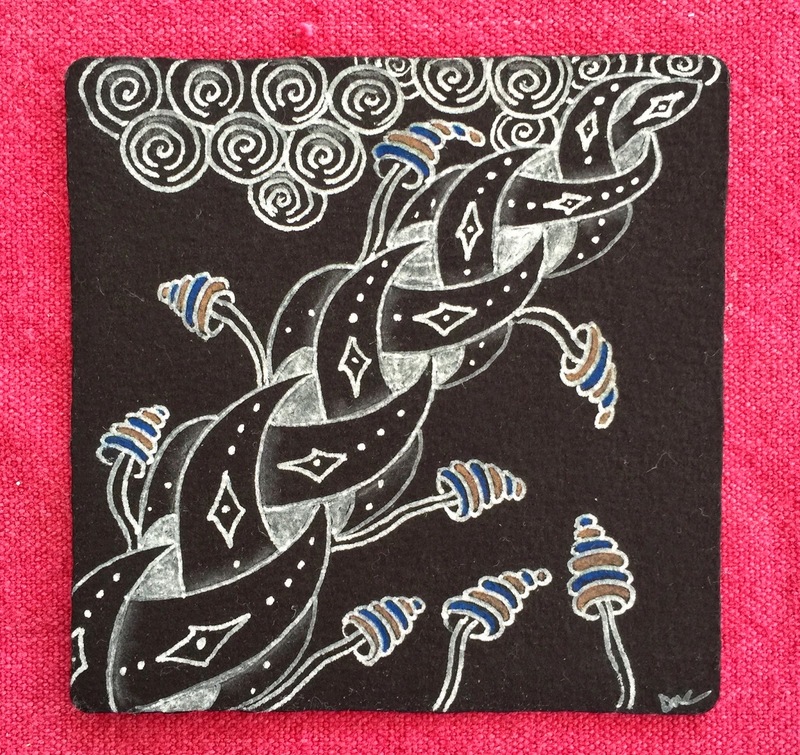 This weeks challenge by the Diva is a "use my tangle" challenge. Dreamcatcher is a tangle that was introduced by Daniel Lamothe and his step outs can be found HERE. 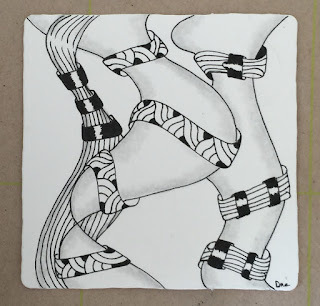 I was so taken by this tangle I started on it right away only to realize that I did not start in the center of the tile. I was going to pitch it, but I hate wasting tiles and in the end, I like it, with all it's wonkiness! Oh boy was this difficult. 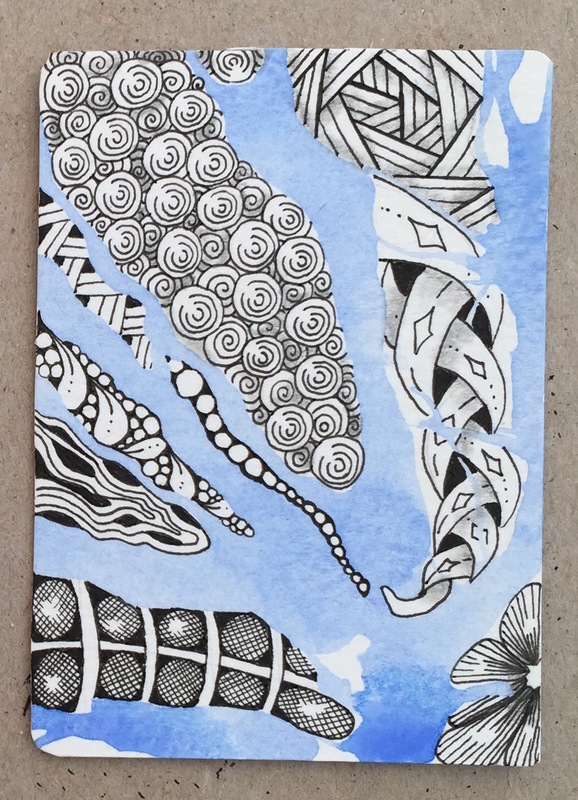 I don't do very many organic tangles but I am drawn to orbs and curvy lines. This exercise was frustrating. Since I have never "got" Shattuck so I tried that, very slowly, on my first tile. I would have loved to add some orbs or just something else so I decided on some drama. Could not even go further. 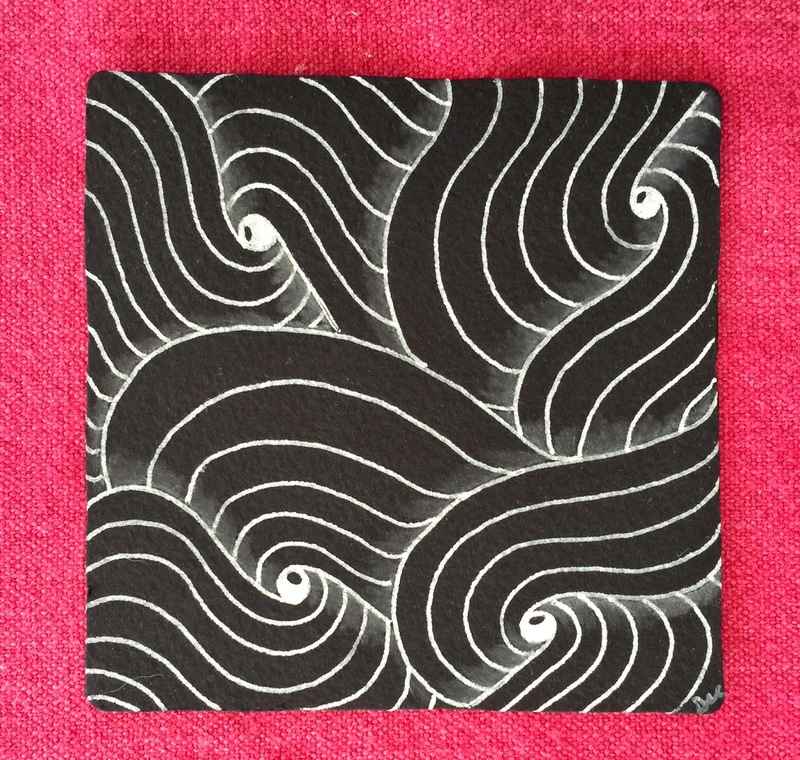 Next tile I tried three curvy tangles and made them straight. Crescent Moon, Nipa, and Orlique. Well you can see for yourself. I am now going to draw some orbs and squiggly lines! Love the Diva, love this tangle. Not always my favorite. I had a hard time "getting" it but, now I love Tripoli. 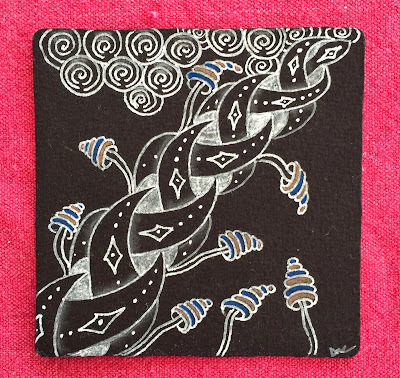 This is a tangle by Tina-Akua Hunziker and you can find step outs on her blog HERE. I tried three different takes on this one little tile. It may have been too much! 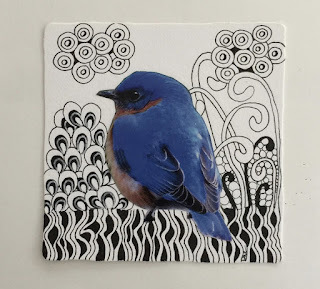 I used the diva's idea of applying black gesso over a white tile because I had two white tiles that I really did not like the final results of. 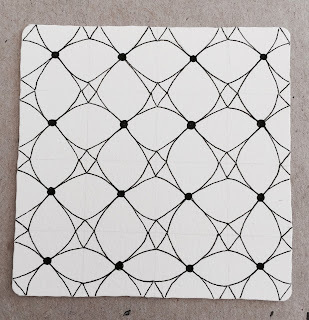 I had never thought of using the black gesso over a white tile before because I have black tiles, but this is a good recycling method. I also really like the texture of the gesso. Our guest challenger this week is Charlotte Carpentier CZT and her business is CharKat’s Creative Insanity, in Temecula, California. 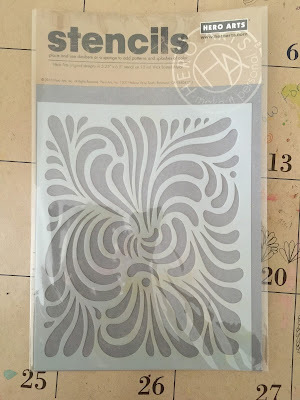 Her creative challenge this week is to use stencils and color of any kind and tangle on top of the result. 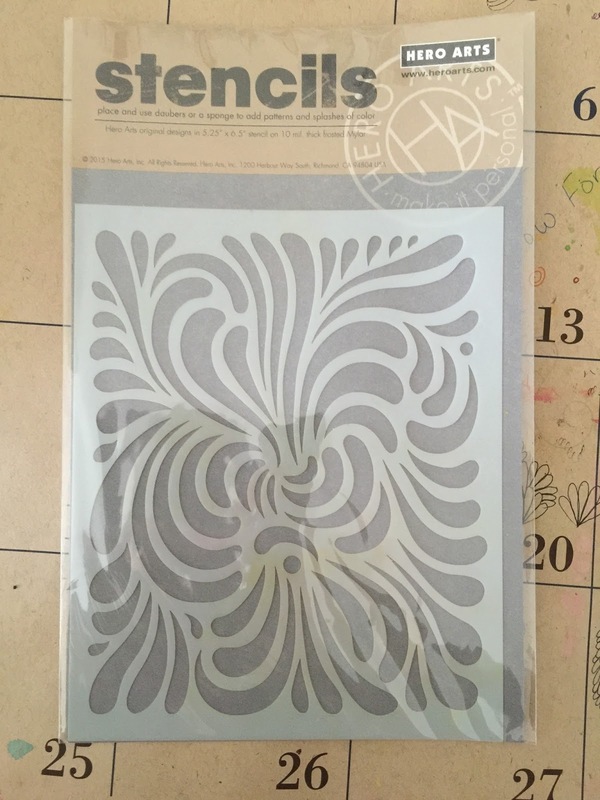 I don't have a lot of stencils and the one I chose has very small spaces. The first tile I wanted to use turmeric in a spray bottle but, I found that you cannot get rid of the tiny granules even after heating it. So I used a makeup wedge and just dabbed it on the tile. After it dried I covered it with my stencil and used blue watercolor to outline the stencil. Not very happy with it, but it is a good exercise to work with what you have. The second one I did, I loved the color so much I didn't want to cover it up so I tangled behind. My favorite thing to do is use inks or watercolor and blow them across the page and then tangle them. This is a recent ATC swap with blown watercolor. 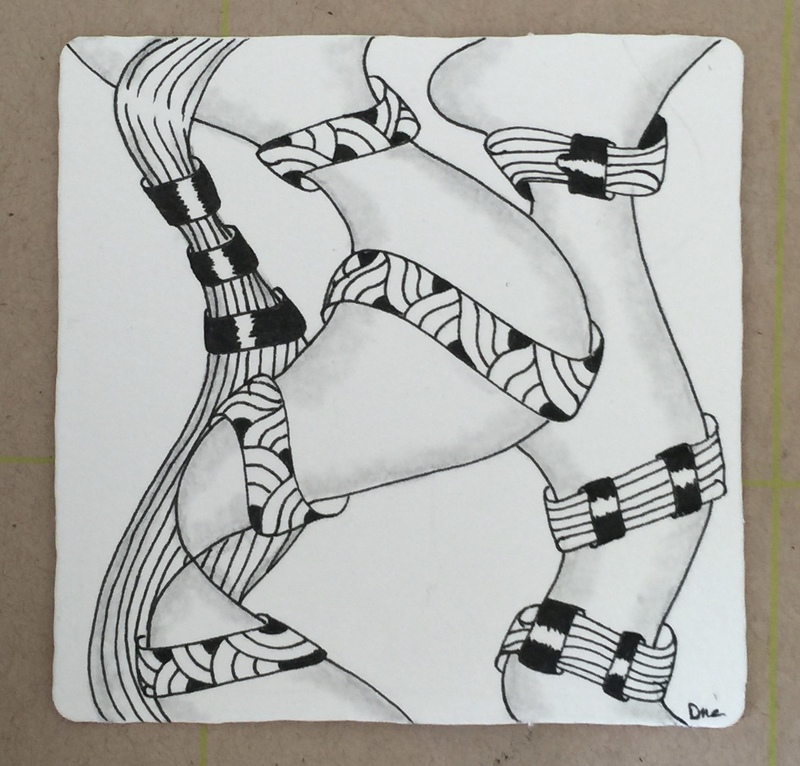 Challenge #236 Tangle something new! I am way behind in this challenge although I love it and will keep it in mind for the future. I have been busy cleaning house, having guests, a lot of fun, and packing up to move back to Boston tomorrow. This is always a sad time for me because I hate to leave Maine but, I keep reminding myself I will be back next month. Yay! So, my rule is, I don't get to look at the results of the Diva challenge before I finish my project. I was not that creative and I didn't even finish but I am posting anyway so I can see what glorious things others have done. Labels: Challenge #236, stones and glass, tangle something new. I will be honest with you, when I sat down to do this challenge Monday, I said to myself "Lets see if we can get this done in 15 minutes." Here it is Wednesday and I am finally posting. My title took off in a direction I seemed to have no control over. When I realized how complicated it was getting I got up and walked away. How could quick look like this? Well, it doesn't. I practically ignored it all day Tuesday because I was a bit angry at it to say the least. I sat down with it today after a nice morning on the beach with my best dog. The end result is not bad. 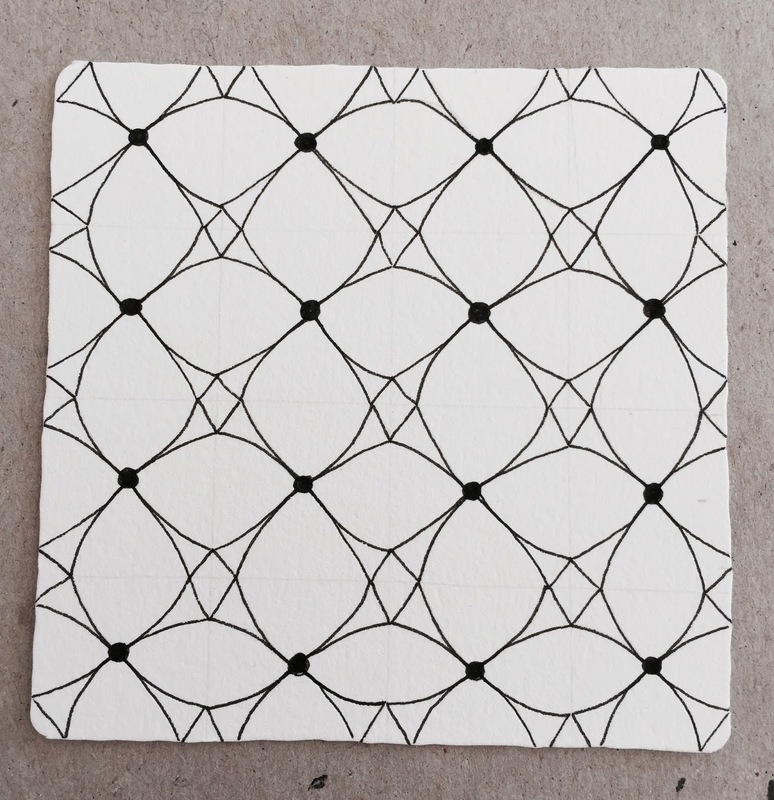 I will try again to make a tile within 15 minutes, not sure they exist anymore. Hurray for Chris Titus! This is her tangle this week which is our challenge. I was attending CanTangle, organized by the fabulous Lisa Heron, this past July in Regina Canada, and I can attest to the fact that Chris was in the last row, back corner seat and she was quiet as a mouse for the longest time ever! This is a fabulous tangle and as many will say, versatile! Ha! that is not a pun. I took some pictures along the way because I am still stuck on Yin Cut and I am afraid it might have drowned out CanT but it is a great look together (I think). This is CanT in one of it's variations. This is CanT with Yin cut in it! This is CanT with Yin Cut and shading. It is so nice to have the Diva back from vacation. Did you see I met her! It was very exciting. She is a hoot and she was successful at even getting me to dance, well, chair dance. It's a thing! Ask the Diva. 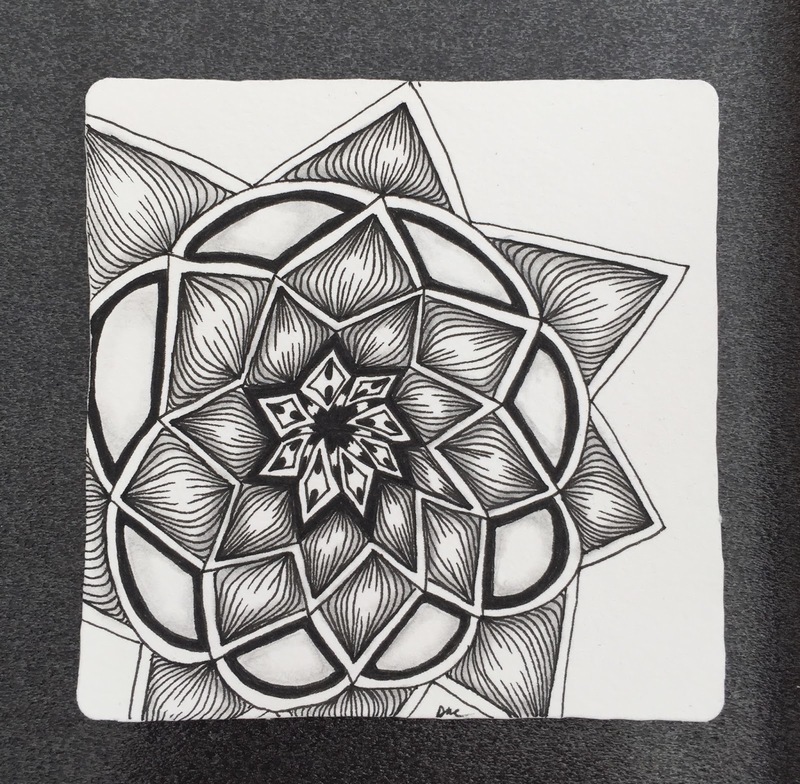 The newest tangle from Zentangle Headquarters is Zenith. You can find step outs HERE. 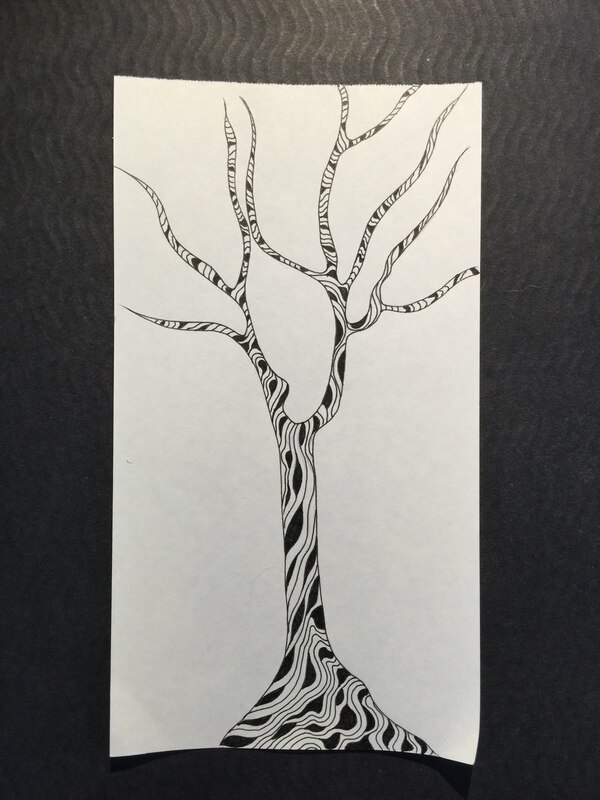 It is a fairly easy tangle to draw but I believe the tangelations may be far reaching. 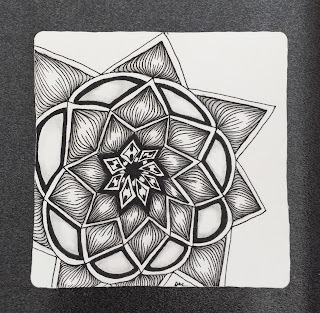 I never look at the entries at Iamthedivaczt.blogspot.com before I finish my tile, but I bet there will be at least 100 different styles. Because I booked myself up for so many things this year I have started to combine my challenges. 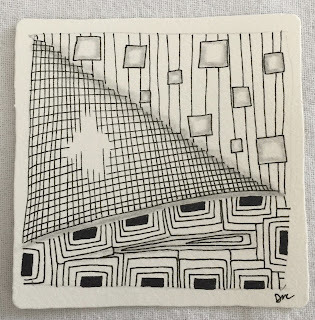 This weeks Square One tangle is yincut. So here Zenith is the border to yincut the center. 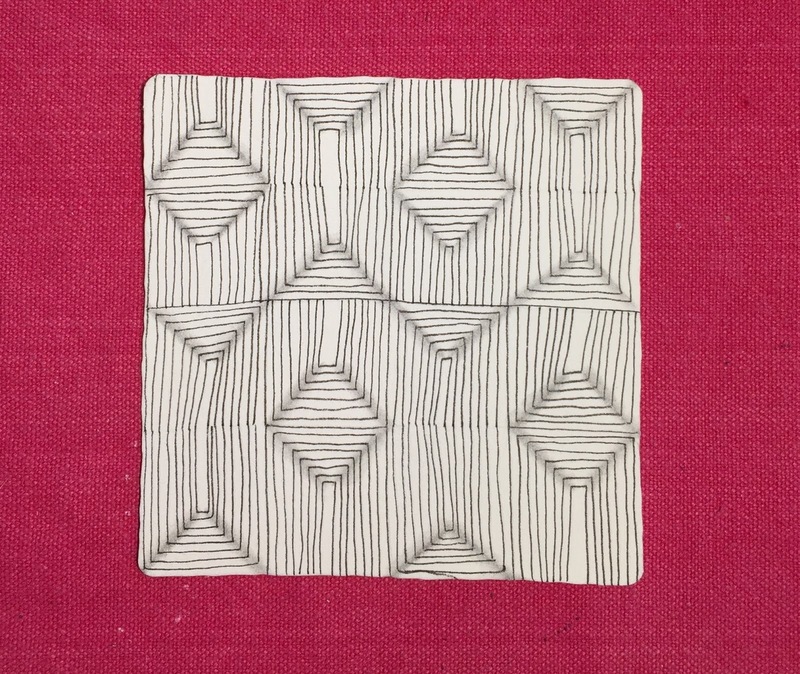 I had the opportunity and pleasure to take a class from Sharla Hicks at the last Tangle U. Although her main subject was using a pastel blue pencil she also reiterated the use of "enhancers" which I am not doing frequently enough. So I pulled out her class notes and looked them over. 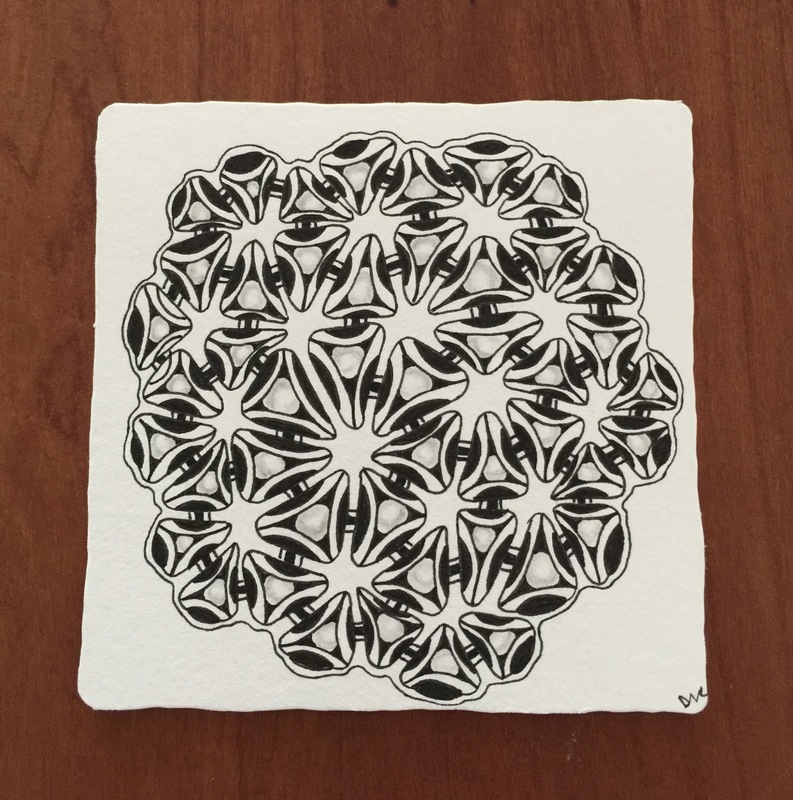 I am a lover of any tangle that is circles or circle related. 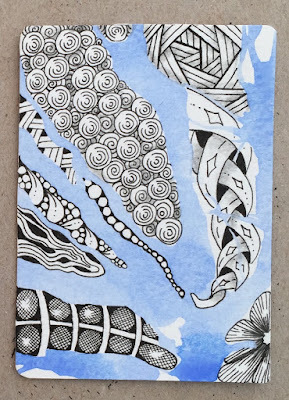 I didn't think I had a C or an S shape tangle that I loved. It did not take me long to think of Verve and realized I could make it curvy if i really tried. 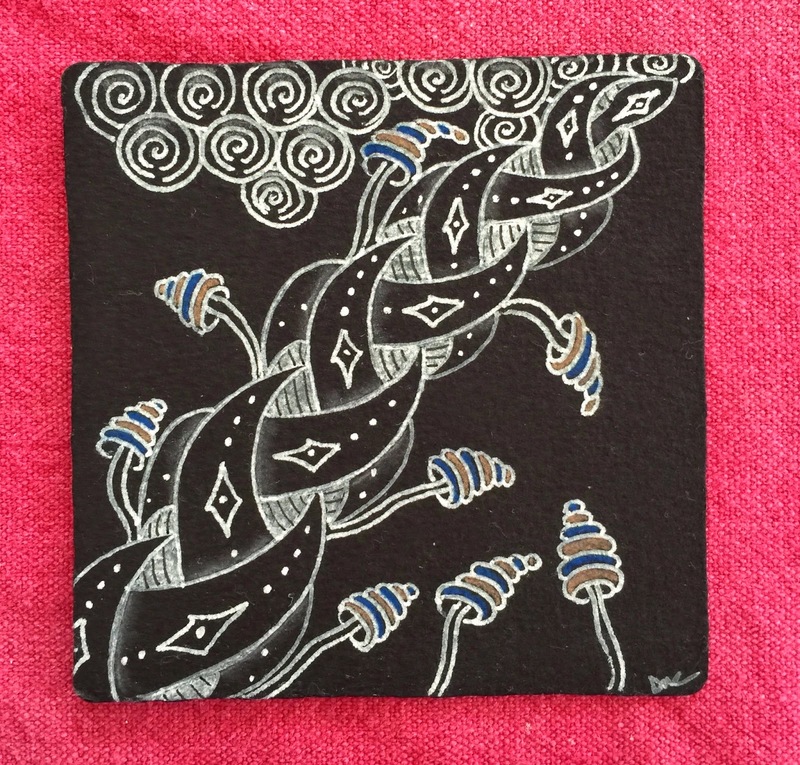 As I am trying to catch up on many projects I started playing in my Tangle-A-Day-Calender. 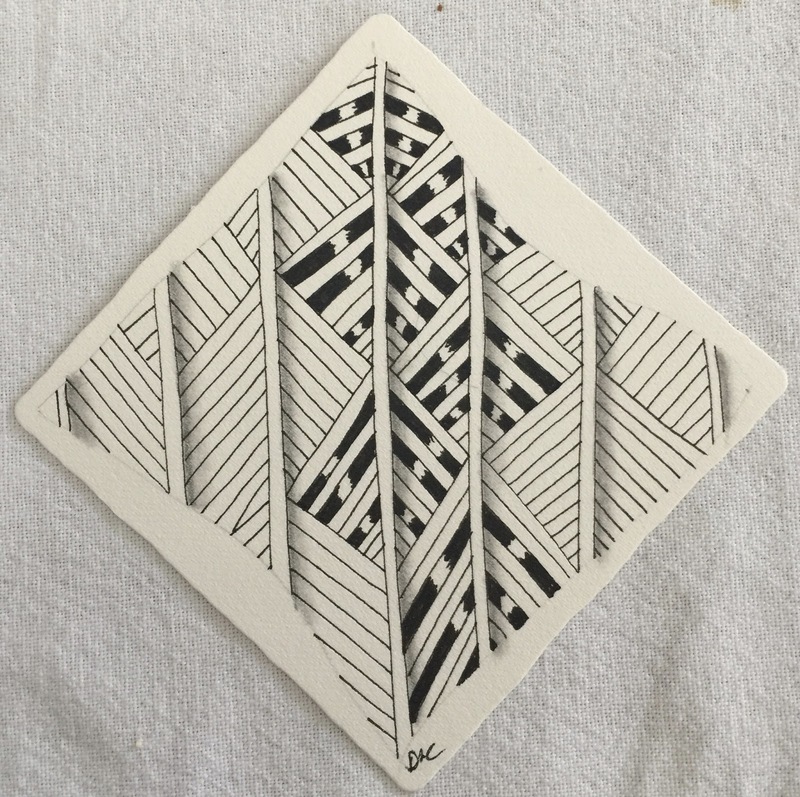 It has become my sketch book in a sense, as it is a great place to try things out and no one sees it unless you offer it up. I will offer it up today. Things got curvier as I went along and I also tried out a couple of enhancers. 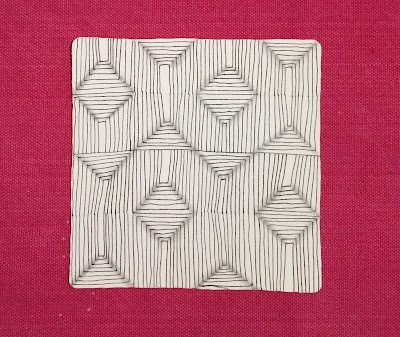 I really liked the last one so decided to try a tile with weighted line enhancer. I might have gone overboard with the shading, but it was screaming out for it. I hate conflicts, so shading it got. Thank you Sharla for a great challenge! Challenge #230 Guest Star Erin Olsen! The Diva (Laura Harms has been away for a while on a well deserved vacation from her blog with her adorable family). We have missed her in the past weeks, although I did meet up with her at CanTangle in Regina Saskatchewan, Canada. 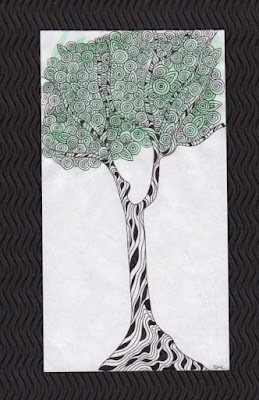 She blew my socks off with her danc'n and pranc'n and having a good ole time with the Zentangle. She is a lovely soul with a different take on how things could be done. I respect that and even had a few dance moves myself, even if they were from the chair. They count! 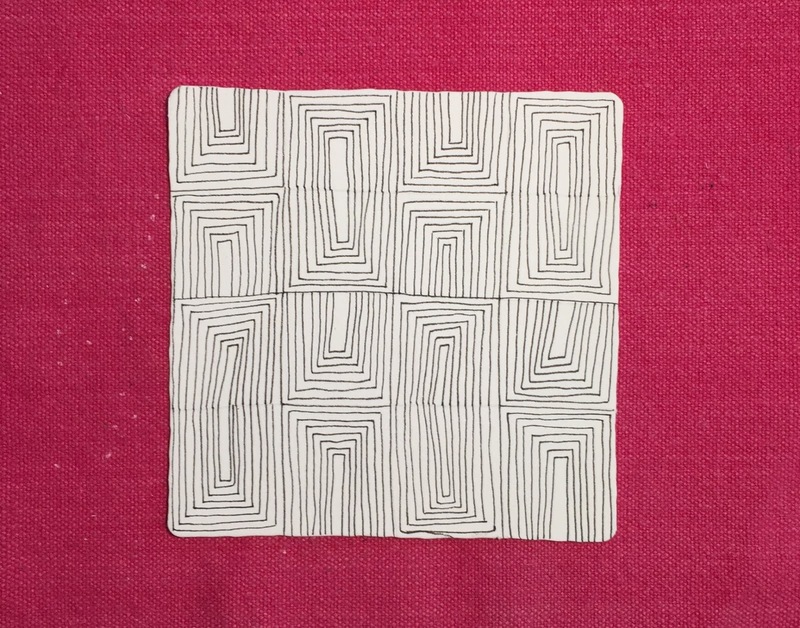 I have been a little obsessed with Margaret Bemners new tangle Pixioze , and of course I could not leave out Diva Dance Rock and Roll and a bit of Screen. So, I have been absent from this blog for almost two months now, but I have not been idle. 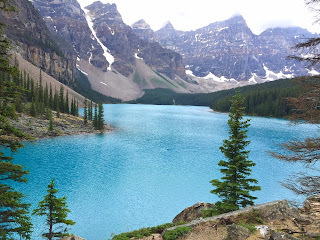 In early July I traveled to Calgary Alberta and attended two days of Stampede. Cowboys and girls dancing in the streets, free pancake breakfasts all over the city, mini donuts, saw the inside of Native American Teepees and all their gorgeous hand crafts and clothing, had my picture taken with some very handsome Mounties, and throughly enjoyed being hosted by a Sandra and her husband Barry. 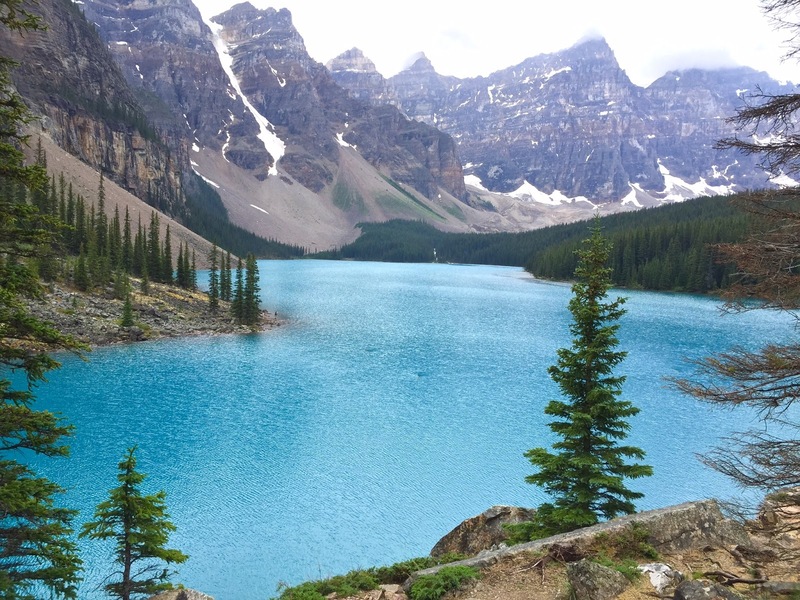 I was traveling with another friend, Chris, so after our fill of fairway food and fun we hit the road to see the sights of Banff. We also took a gondola ride up to the top of Sulfur Mountain and saw just so many mountain peaks, and the little town below. Fear not, we even made time for a soak in the hot springs, which we did only after a complete salt body scrub and an hour massage (my first one!). One draw back to the time spent in Banff, which this is the ONLY one, was a not so nice hotel that's only redeeming feature was a liquor store located in the lobby. Already looking back and laughing. It being mostly prairie there was not a ton to see. Although we were all fascinated by the fields of canola growing beside the highway. We were to early in the season to see the flax growing, but we were told it is a beautiful blue. CANTANGLE! This post is already quite long and we all know what a joy it is to be in a room with like minded people for a full weekend. The time spent was fabulous and I won't be able to say enough here. I will show you just some of the wonderful people I met and saw again! Abundies, Zedbra, Cruffle, Wud, (not sure if the atlternate lines have a name) Black Pearlz. Now that I am looking at it on the screen, I may go in and blacken the top. 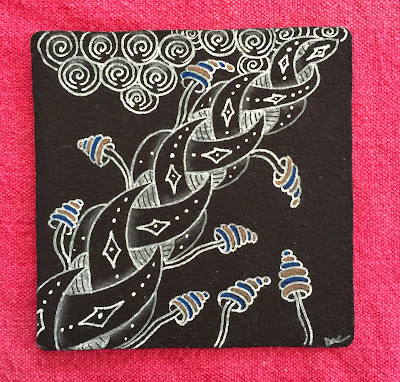 The tangle this week is by Alice Hendon which you can find HERE. 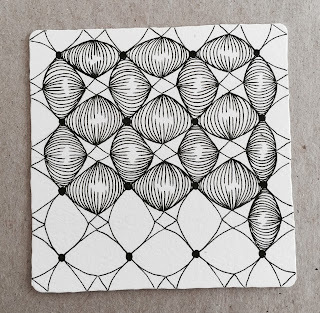 This is a great tangle to show the power of shading. I like-mono tangles so that is what I did, Before and after shading. I have not tangled in a bit and you can tell by the shaky lines. I will get back on board soon. Hmmm.......not my favorite, but I am willing to spend time with it. I have many new supplies I would like to try out so now is as good a time as any. 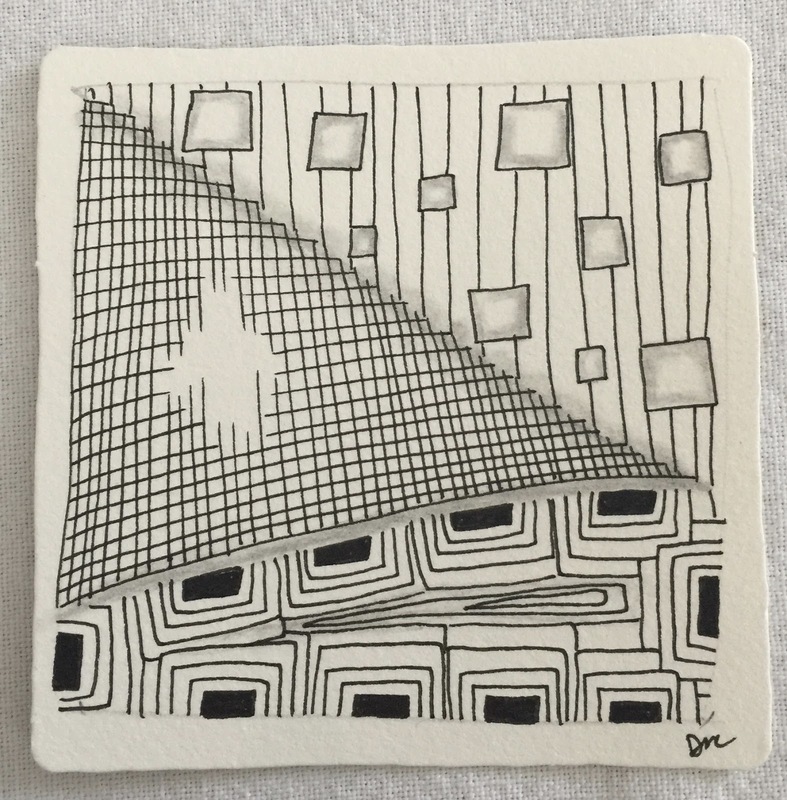 First tile I find to busy although I realize some of you may like it. After scanning it I added black lines over the Angelic signo pen to add a little depth. This second tile I like better for it's simplicity and and it's foggy ocean feel. 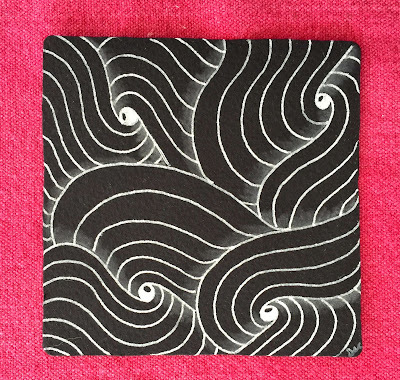 Verve in White Signo, Pearls are white gelly roll and shading is in dk gray chalk pastel pencil. 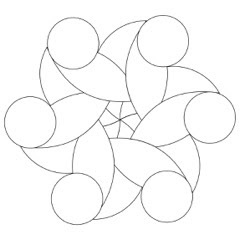 In April I traveled to Santa Fe, New Mexico to attend Tangle University where CZT's from all over the US and many different countries, come to learn from other CZT's about our craft. It is in it's third year and it is something I look forward to every year. The CZT crowd is a bunch of like minded, fun people that are always a blast to meet up with, if only for a long weekend. There never seems to be an end to good food, good friends and a mind blowing amount of things to learn. I have come back with many unfinished projects and some cool new tools that I have yet to play with. 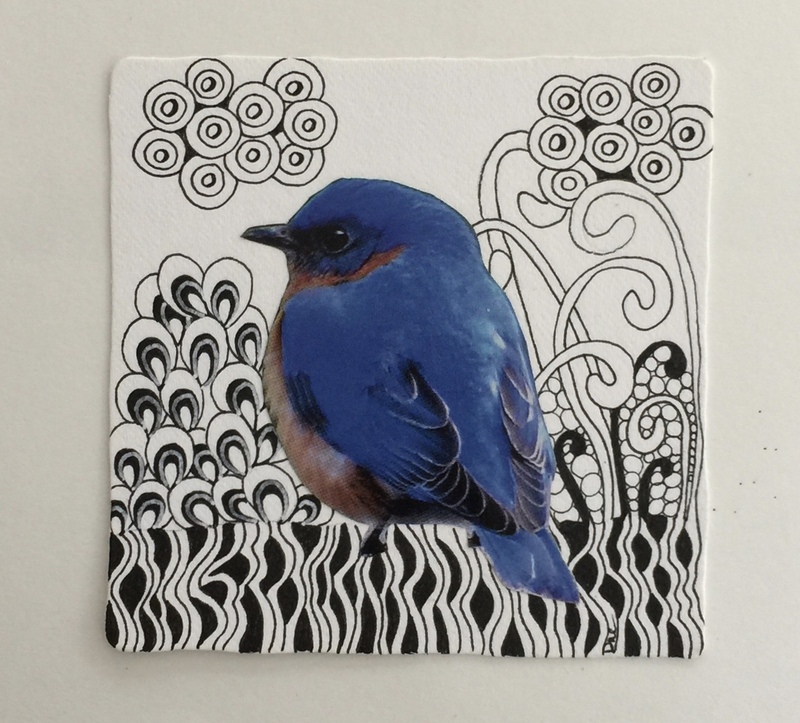 The one project I did get done was taught by Kate Lamontagne. We used a new tool called a Helix Angle and Circle Maker . 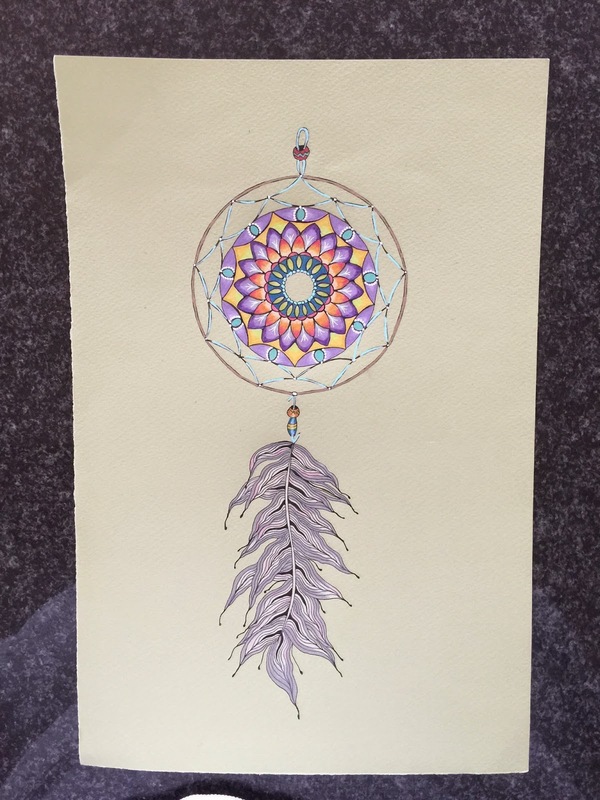 This is an inexpensive and very simple tool to make Mandalas, or in our case, we made dream catchers, and learned to use colored pencils. It was just fascinating. I was home less than a week and repacked my bags for an adventure by car. Oh what fun! 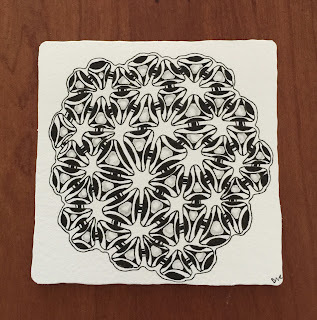 I drove to a fellow CZT, Chris Titus's home in upper New York state and spent a few days in her wonderful studio where we actually took a class in renaissance tiles via Skype from fellow CZT Meredith Yuhas. (A first for all of us!) The following is her tile as I left mine behind in Boston. 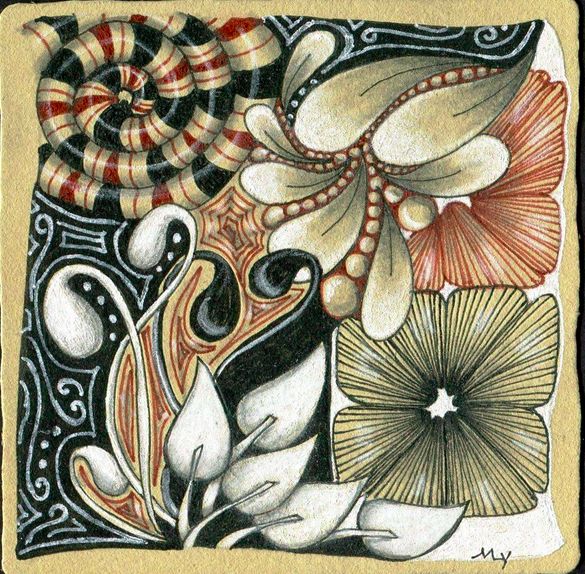 We used black and brown micron pens, white charcoal pencil, white gelly roll pen, graphite and we were all amazed at the results. 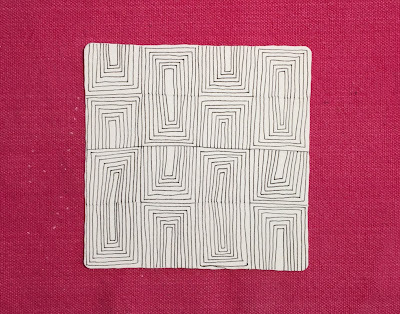 Meredith's work is just yummy. After a few days of "playing" in the studio, we were on the road again along with Deborah Bartlett on the next leg of our adventure. We drove to the American side of Niagara Falls and walked about, having lunch at a casino just so we could see inside and spend a small amount on playing the games (another first for me!) We all left with 2Cents! We walked in tunnels behind the falls, which were amazingly loud, if not a bit scary and then just spent time at the bottom of the falls watching the water and listening to the power of them. It was a beautiful morning and I believe we spent 4 to 5 hours just taking it all in. After this fabulous weekend we headed back to New York where Chris and a friend were to fly out the next morning to Southwest Harbor Maine and spend a few weeks soaking up the Maine coast and I was to drive back to Boston. Well, things do not always go as planned and Chris and I were in the car again, this time heading for Southwest Harbor Maine! Ten hours later we arrived in a beautiful spot her sister rents every year and I was asked to spend some time. Well, why not! More good company, in a State I love, I couldn't say no. I found myself celebrating Cinco De Mayo at a restaurant in Maine with half price margaritas (original and blueberry basil) while my youngest celebrated his 26th birthday in Brooklyn NY. I stayed for several days then made the journey back to Boston. 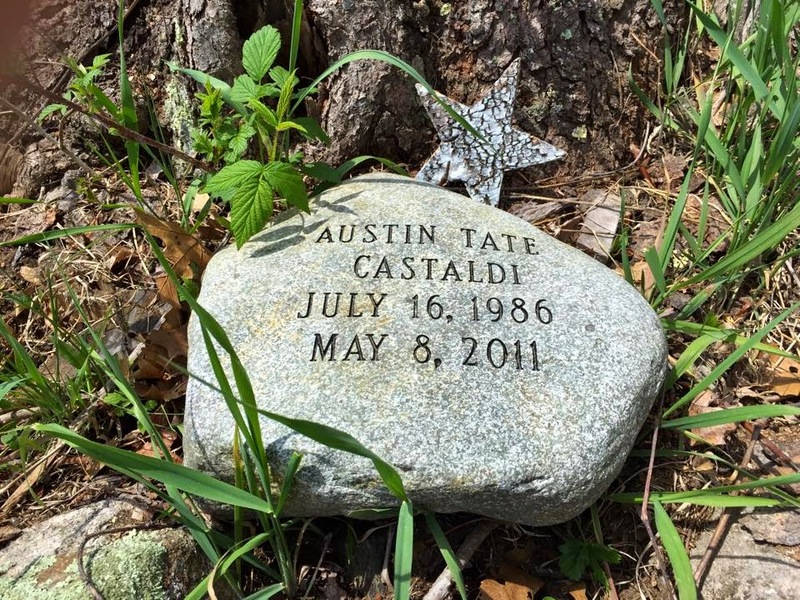 It happened to be the fourth anniversary of my eldest sons passing, so I made a stop in Andover and walked up to Holt Hill to spend some quiet time and leave a little something. It is a beautiful spot where you can see the thirty miles to Boston Skyline. He will always be loved and never forgotten. Shine on! I stayed in Boston for the weekend and packed up for my summer in Mid-Coast Maine where I am now. A new trip is planned for July! Again to Canada but a whole different part! Woohoo!